Headed for a cruise in Galveston? Staying on the island before or after your cruise is highly recommended. Galveston is one of the most historic cities in Texas, and as a tourist destination, there are tons of things for you to do. Add that to the miles of Gulf Coast beaches and Galveston should be a port of call itself — not just a place to board your cruise ship. Of course, if you’re staying at a local hotel, then you still have to get to the cruise port. Luckily, Galveston is a pretty compact. Any hotel on the island will only be a $10-15 cab ride to the cruise terminal. Still, if you don’t have to pay for cab fare, then that’s money that you can save and spend on fun during the cruise. That’s why we called and spoke to dozens of hotels on the island to see if they offer a shuttle to the port. Many hotels do, but combine the shuttle with parking and charge a small fee. This is a great deal if you plan to park at your hotel as well (the cheapest parking for a 7-day cruise is around $50). 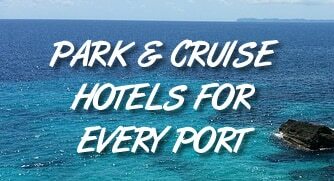 If you don’t have a car you are parking, but still want to catch a shuttle, there are still plenty of hotels that you can stay at and then catch a ride to the port on cruise day. The hotels listed below offer a shuttle alone, without parking. Be sure to call ahead about prices as they can change. If you have kids, then they may already be begging you to go to Schlitterbahn on Galveston Island. This hotel is part of the park and is the closest place to stay near the waterpark. It is a bit of a drive from the cruise port, but offers a parking package with transportation to the port included. Situated on Galveston’s west end, this hotel is close to the water, as well as attractions like Magic Carpet Putt-Putt, batting cages, movie theater, and the Galveston fishing pier. Rides are a little pricey at $20 per person, but will get you there on cruise day and include free parking during your trip. Situated near the ferry landing, if you stay one night you can park for free while you cruise. In addition, the hotel offers a free shuttle to the cruise port on weekends. If you are sailing out on a weekend, then you’ll need to find other arrangements. Staying at the Hilton? You’ll have a great location with the beach just steps away from your room, but you’ll also have access to a free shuttle to the port. The hotel is also close to a grocery store if you need to make a stop before heading to the ship. Booking the parking package through the hotel means you get parking and transportation included in your fare. Hotel Galvez is among the grandest and most historic hotels on the island. It’s a sister hotel of The Tremont House, located right by the cruise terminal. There is a free shuttle to the port to go with your stay but parking costs $18 while you are away. If you want to stay in the historic Strand district, then The Tremont House is your best option. It’s right near the port so you actually don’t even need to use a shuttle. Most people can just walk the three blocks to the port. However, if you are parking then you’ll park at the Hotel Galvez and then ride the shuttle back to the cruise terminals. The San Luis sits right on the Seawall. However, what makes it special is that it’s a resort more than just a hotel. With a resort style pool, restaurant, and spa, you can have a complete vacation without leaving the building. It’s about 10 minutes away from the cruise port. The hotel offers a parking package, or you can pay $8 per day parking with a ride to the port. DoubleTree has a “Cruise and Park” package that includes your parking and transportation to and from the terminal. Just so you know, the parking package rates are about $50 more per night than traditional rates in our search. Do these places have free long term parking as well? I am desperately trying to find a ride sharing company with accessible transportation from Hobby to Galveston for a cruise on Carnival. I will be arriving the day before the cruise and staying in a hotel. I know I can take an accessible taxicab to the terminal from the hotel….but my problem is getting from Hobby to the hotel. I will also need to have an accessible transportation after the cruise. HELP! How accessible do you need? For instance, do you simply need a place to put a wheelchair or do you need to have lifts, ramps, or something similar? If you can transfer yourself, then Lyft or Uber should be fine. The driver will just need to break down a wheelchair. If you need something more accessible, we’d suggest calling a local taxi company and seeing if they offer a vehicle that can accommodate you.